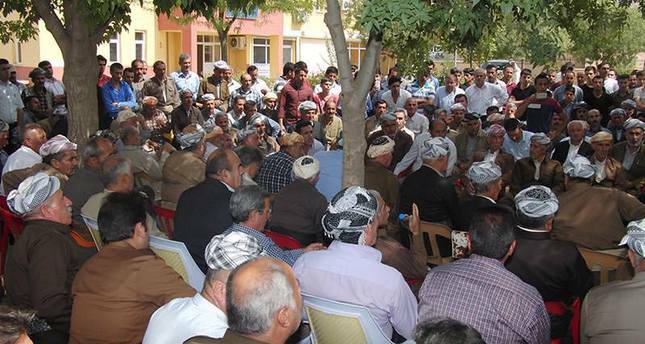 Around 400 Kurdish people affiliated with the Gerdi Tribe in southeastern Hakkari's Derecik town have come together on Wednesday and announced that they will stand against the terrorist PKK and side with the Turkish state in Turkey and the President of the Iraqi Kurdistan Regional Government (KRG), Masoud Barzani in Iraq. "We will not embrace the PKK and will stand on the side of the state" the town's mayor Ekrem Çetinkaya –who is affiliated with the Gerdi Tribe- told reporters. "We believe that the current terrorist incidents damage the people of the region" Çetinkaya said, who noted that the tribe has 25,000 members in Derecik and its villages, and around 40,000 members in Northern Iraq. Çetinkaya said that the tribe has decided to come together following the surge of terrorist attacks carried out by the PKK and show their stance. He underscored that the Gerdi Tribe does not accept the PKK as representatives and recognize the state as the legitimate force in the region. The Kurdish mayor noted that PKK attacks have also killed their people: "Recently, a man by the name of Celal İnan has lost his life in a terrorist attack by the PKK in Durak Village" he said. The tribe members have then expressed their views regarding the issue and reportedly sent a letter to Barzani in Northern Iraq to inform him about their stance. Turkey has been hit by violence since a suicide bomb attack by a suspected ISIS supporter killed 32 activists in Suruç on July 20. The Turkish government has intensified its counterterror operations following the recent attacks carried out against Turkish forces and civilians by the PKK, which is recognized as a terrorist organization by the U.S., the EU and Turkey. Turkish security forces have arrested hundreds of people with suspected links to ISIS, the PKK, and leftist groups, detaining over 1,300 people across the country, according to a recent statement released by the Prime Minister's Office. The Turkish Air Force has been carrying airstrikes against the PKK in northern Iraq and the ISIS terrorists in northern Syria.